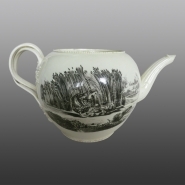 Creamware teapot printed in black with a figure of Minerva signed "Thomas Rothwell" and "Sculpsit" [i.e. engraved it] to left and right. Minerva is seated with emblems of Wisdom and Industry and the motto: "Let Wisdom Unite Us" but framed incongruously by trophies of dead game hanging on either side. Rothwell is said to have moved from Liverpool and to have been working for Humphrey Palmer in Hanley by about 1767, but was living in Birmingham by 1773. It is possible that some pots bearing this print were made by Palmer or his partner and successor Neale, but it is also possible that Rothwell executed the print for another potter as a freelance engraver. The other side is printed with a boy and girl finding young partridges in a field of wheat as it is being harvested. One of the four applied terminals on the entwined double handle. Does this precise form of terminal occur on pots marked by Palmer or his partner and successor Neale?